It is possible that the estimated higher STTD phosphorus requirements were driven by the improved growth performance when phytase was added to diets. Phosphorus is the second most abundant mineral in animal body after calcium, and its dietary concentration greatly affects pig growth performance and diet cost. The National Research Council (2012) estimated the standardized total tract digestible phosphorus requirement for nursery pigs using a simple regression method based on a limited amount of published studies. Empirical data are needed to validate these STTD phosphorus requirement estimates. In addition, modern nursery diets often contain high levels of phytase to reduce the use of inorganic phosphorus source and to promote pig growth performance. It can be hypothesized that the growth-promoting effects of phytase may, in turn, alter pigs’ nutrient requirements. Therefore, we conducted a study to update the dietary phosphorus requirements of 13- to 28-pound pigs fed diets without or with high levels of phytase. In this study, 1,080 nursery pigs initially 13 pounds body weight were used in a 25-day growth trial. Pens of pigs (10 pigs per pen, nine pens per treatment) were allotted to 12 treatments. Dietary treatments were arranged in two sets of dose titration with six levels of STTD phosphorus without and with 2,000 unit of phytase (DSM Nutritional Products Inc., Parsippany, N.J.). 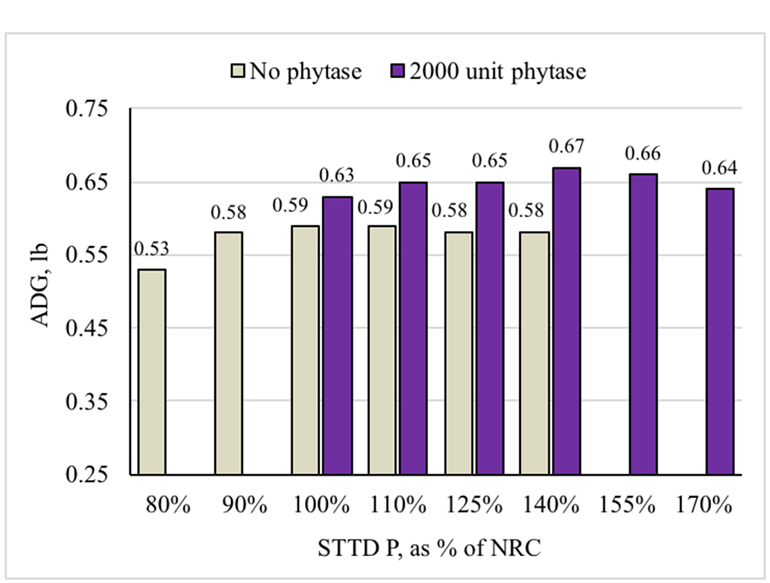 The STTD phosphorus levels were expressed as the percentage of the NRC (2012) requirement because two feeding phases were involved. The NRC lists requirements of 0.45 and 0.40% for pigs from 11 to 15 and 15 to 24 pounds, respectively. Digestible phosphorus levels in diets containing phytase included the manufacturer suggested release value of 0.158% STTD phosphorus for 2,000 units of phytase. All diets were balanced for an analyzed calcium:analyzed phosphorus ratio of 1.20:1. On Day 25, radius bones from one median-weight gilt per pen were collected for analysis of bone ash. For growth performance, pigs fed increasing STTD phosphorus in diets, regardless of phytase addition, improved average daily gain (quadratic, P < 0.05), F/G and percentage bone ash (linear, P < 0.01). Average daily feed intake increased (quadratic, P = 0.043) as STTD phosphorus increased in diets without phytase, but not for diets containing phytase. For pigs with added phytase to the diet, they had improved ADG, ADFI and F/G (P < 0.001) regardless of STTD phosphorus levels. Potential mechanisms for this extra-phosphoric (“super-dose”) effect of phytase include the destruction of anti-nutritional effects of phytate and generation of other nutrients such as inositol as well as better availability of other nutrients like AA, minerals or energy. 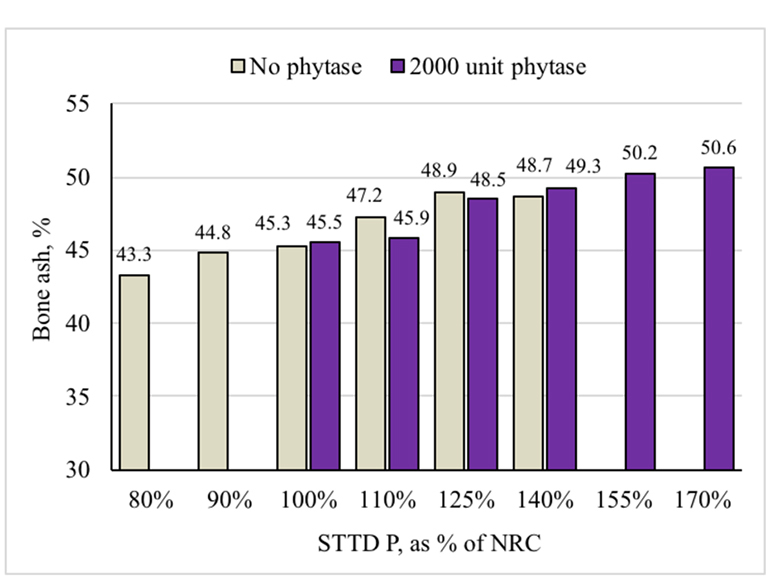 For pigs fed diets without added phytase, maximum ADG could be achieved at as low as 91% of NRC (Figure 1). However, in diets containing phytase, maximum ADG was achieved at 138% of NRC, but 122% of NRC was enough to achieve 99% of the maximum ADG. Figure 1: Effects of increasing digestible phosphorous on average daily gain of pigs fed diets without and with phytase. 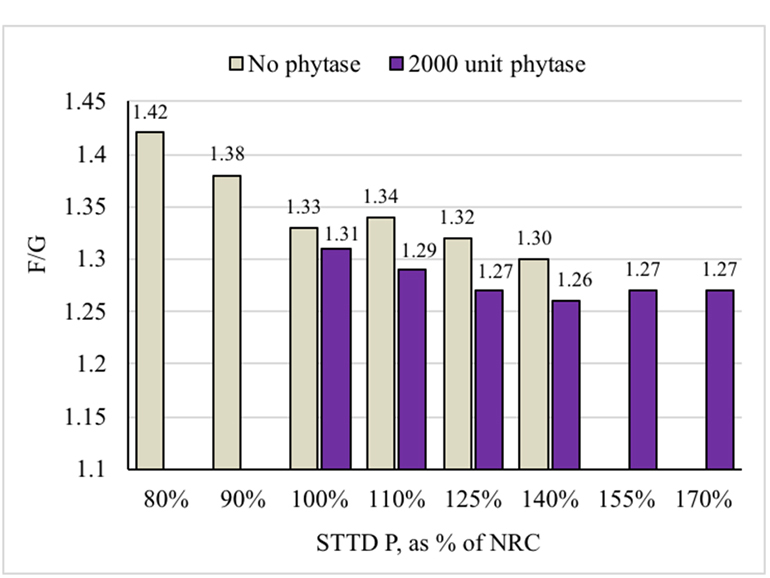 For feed efficiency, STTD phosphorus requirement for best F/G appeared to be around 102% of NRC for diets without phytase and 116% of NRC for diets containing phytase (Figure 2). Figure 2: Effects of increasing digestible phosphorus on F/G of pigs fed diets without and with phytase. Increasing STTD phosphorus in diets, regardless of phytase addition, linearly increased percentage of bone ash, suggesting that the requirement for maximum bone mineralization was greater than our tested ranges (Figure 3). The bone ash values also indicated that the phosphorus release value for phytase was accurately estimated. Figure 3: Effects of increasing digestible phosphorus on percentage bone ash of pigs fed diets without and with phytase. In conclusion, the NRC (2012) recommendations for dietary STTD phosphorus are reasonably accurate for ADG and F/G responses when diets do not contain phytase. However, when a high level of phytase was added in the diets, the estimated STTD phosphorus requirements for maximum ADG and feed efficiency were generally increased. It is possible that the estimated higher STTD phosphorus requirements were driven by the improved growth performance when phytase was added to diets.